What is the best way to achieve social justice in Scotland? The STUC and its affiliated unions working alongside civic groups, is promoting a discussion on Scotland’s future. 31 October 2014: UNISON Scotland believes that the debate on further devolution should be more than an examination of mechanisms. We recognise the importance of getting the balance of powers right and that should be done with some guiding principles such as subsidiarity. In this submission to the Smith Commission we have outlined how extended devolution could be delivered with greater control over fiscal and other powers. In some cases this would give the Scottish Parliament the levers to address specifically Scottish issues. In other cases simply because it we would do things differently in Scotland without undermining the solidarity of the UK. One of the strengths of devolution is that other parts of the UK can learn from the success and failures of different approaches. In this debate we should always remember that we seek greater devolved powers for the purpose of improving people’s lives. The constitutional mechanics are a means to an end. Not an end in themselves. On 19 September, Prime Minister David Cameron announced that Lord Smith of Kelvin had agreed to oversee the process to take forward the devolution commitments on further powers for the Scottish Parliament. The terms of reference for the Smith Commission are to convene cross-party talks and facilitate an inclusive engagement process across Scotland to produce, by 30 November 2014, Heads of Agreement with recommendations for further devolution of powers to the Scottish Parliament. This process will be informed by a Command Paper, to be published by 31 October and will result in the publication of draft clauses by 25 January. The recommendations will deliver more financial, welfare and taxation powers, strengthening the Scottish Parliament within the United Kingdom. Interested parties have until 31 October to submit views, and UNISON Scotland will do this directly and through the STUC. 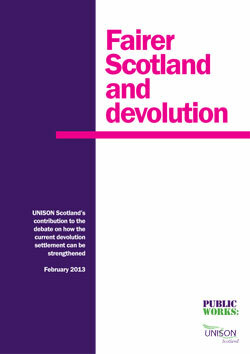 In February 2013, UNISON Scotland had adopted Fairer Scotland and Devolution, our contribution to the debate on how devolution settlement can be strengthened. It is evident that the grounds of the debate have altered since that time and it would be appropriate to review that statement. In the absence of a meeting of the Scottish Council before the submission date of 31 October, the Scottish Committee Policy seminar will meet on 23 -24 October and will consider submissions from branches. This independence referendum has been extra-ordinary. The turnout alone (84%) the highest for any election in over 60 years– tells you how seriously voters took their responsibility. It is a truly humbling experience to see the power of democracy at times like this. UNISON is the biggest trade union in Scotland. We took our role to ensure that the debate about Scotland constitutional future delivered concrete benefits for working people very seriously too. 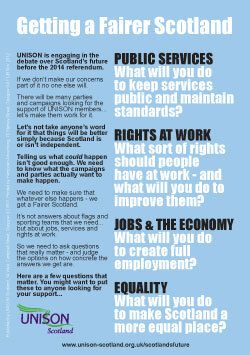 We engaged our membership through the formal processes at UNISON Scottish Council and a series of area consultations. The extent of the engagement amongst our members was reflected in what we have seen across community and town halls throughout Scotland. The views and reflections of UNISON members were articulated in our two documents A Fairer Scotland and Fairer Scotland and Devolution. I am grateful that we received the full support of UNISON at a UK level as expressed in a resolution at the national 2014 delegate conference which urged UNISON members in Scotland to engage in the debate and to press for commitments from all parties along the lines of UNISON’s Fairer Scotland proposals. Our key concerns were the role public services play in improving the quality of lives for ordinary people, and the levers for the economy and how they are used to create decent jobs, tackle low pay and end poverty. The future of public services was debated across the media, local communities and families in Scotland. It clearly weighed on the minds of most as they casted their vote in this referendum. Their message has been clear. People value public services; they want more investment not more cuts; they reject privatisation and they demand that public services remain in public hands. They also want a new fairer more equal society. I want to thank our members for the role they have played in this whole process, and to recognise the humour and respect with which this debate has been conducted within UNISON. I think this has been reflected in the debate across Scotland more generally. UNISON, as Scotland's biggest trade union, takes its responsibility to support constructive debate very seriously. We will work to continue the extra-ordinary political engagement we have seen to press our agenda to build better public services that improve the quality of all our lives and to build the just and fairer society that so many of us are calling for. Our role now is to work with other trade unions and civic society to help bring Scotland together. We will expect that the promises of more powers made by the main parties in Better Together will be delivered. However as we stated at the beginning of the referendum campaign the real question is how new or indeed existing powers are to be used for the benefit of working people. This work continues on 15 and 18 October when UNISON will join the STUC and Poverty Alliance conference and rally as part the Challenge Poverty Week, when trade union members from across Scotland are coming together to say it’s now time to create a just and fairer Scotland. With this document, UNISON Scotland opens up a debate which has so far focused on fiscal issues and argues that new devolved powers for the Scottish parliament are essential to create a Fairer Scotland and improve the lives of working people. UNISON Scotland says a range of fresh powers should be devolved: public sector pensions, health and safety, labour market regulation and broadcasting - as well as stronger fiscal powers, including all of income tax revenue. UNISON's approach to constitutional questions is driven by the interests of our members, by the sort of Scotland we want and deserve to live in. This means that for us, precise constitutional arrangements are the end point and not the starting point of the debate. We must first define the sort of Scotland we wish to see and then try and then examine the likelihood of differing constitutional arrangements on offer to deliver on that vision. Our role is not to promote or condemn the politics of national identity, Scottish or British. We should not accept at face value any of the claims from any side of the constitutional debate. Our role is to examine assertions made by all sides in the constitutional debate, to get them to spell out what their proposals mean for working people. Our objective is tackling inequalities, poor health and deprivation. Doing so is social change and unless it is explained how this is to be achieved, arguments for or against constitutional change mean very little. What will you do to keep services public and maintain standards? What sort of rights should people have at work - and what will you do to improve them? What will you do to create full employment? What will you do to make Scotland a more equal place? A Just Scotland lays out challenges for both sides of the debate. In particular it criticises the use of misleading figures in the debate over Scotland’s fiscal position. The report identifies deep problems with the economic and fiscal model imagined by the leading voices in the YES Campaign. However it also calls on the Better Together parties to outline a practical vision of how social and economic justice can achieved within the union and to calls for detailed attention to be paid to proposals for enhanced devolution. OCTOBER 2012 - Section 30 agreed on transferring legal power to hold the referendum from Westminster to Holyrood. LATE 2012 - Electoral Commission begins its preparations, such as examining the issue of a fair question on whether Scotland leaves the UK. FEBRUARY 2013 - Section 30 order receives backing of the Privy Council. SPRING 2013 - Referendum bill comes before the Scottish Parliament at Holyrood. OCTOBER 2013 -The Referendum bill passes its final stage at Holyrood, a certainty, given the SNP’s overall majority. NOVEMBER 2013 - The Referendum bill receives Royal Assent. NOVEMBER 2013 - The Scottish Government publishes white paper on independence, which is expected to attempt to answer questions about membership of the European Union and defence of the nation. Unionist parties and the UK government say they will publish regular documents setting out the benefits of the Union. SUMMER 2014 - Referendum campaign officially begins. END OF 2014 - Latest date referendum can be held. UNISON members are taking part in the constitutional debate through meetings across the country ahead of to STUC community events. This is the next stage in a process that started with a briefing, discussion paper and workshops at the union’s Scottish Council of branches. UNISON Scotland’s approach to constitutional questions is one that is driven by the interests of our members, by the sort of Scotland we want and deserve to live in. This means that for us constitutional arrangements are the end point of the debate not the starting point. We must first define the sort of Scotland we wish to see and then try and then examine the likelihood of differing constitutional arrangements to deliver on that vision. To support this approach UNISON Scotland published a briefing on constitutional change (Feb 2012 - pdf) on constitutional change together with a more detailed discussion paper for branches. Based on the views received, we made a response to both the UK and Scottish government consultations (Mar 2012 - pdf) on the referendum process. In April, Scottish Council considered what a UNISON vision for Scotland should look like. Workshops also looked at what independence might mean for UNISON members as well as what further powers we might want devolved to Scotland. 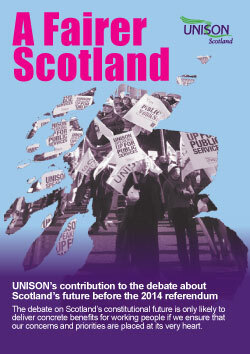 These views have contributed to this draft UNISON ‘Vision for a Fairer Scotland’ (Aug 2012 - pdf). The next stage of the process is to encourage a wider engagement with members across Scotland, in conjunction with an STUC initiative to engage communities in the constitutional debate. We are holding a series of UNISON meetings across Scotland the week before the STUC events. Details are here Constitutional Change Events - UNISON + STUC Autumn 2012 (pdf) - check with your branches for more info and registration. Depute Convener Stephen Smellie gave an insight into the debate at UNISON’s National Conference in June: “It is not about where the political power is held - Edinburgh or London - but what the politicians will do with that power, and how it will make a difference to our security of employment or our children’s future”, he told delegates.